Bitcoin, the popular digital currency, is transforming how we trade and spend money. Think of it as electronic cash that you can send or receive anywhere, anytime. As a Café Casino member, you can get a 600% Super Play Bitcoin Match bonus up to $6,000 or a 150% No Max Bitcoin Match Bonus up to $1,500! 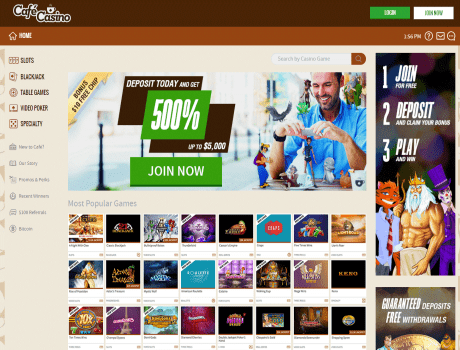 Consists of one (1) 600% match bonus up to $6,000, only valid on bitcoin deposits. The deposit plus bonus amount is subject to a 35X playthrough requirement as well as a max cashout of 10x the value of the deposit. Any winning above the 10x deposit amount, based on the bonus code will be forfeited upon cashout. Some games contribute towards playthrough requirements; however certain games may have a greater contribution than others. Consists of one (1) 150% match bonus up to $1,500, only valid on bitcoin deposits. The deposit plus bonus amount is subject to a 25X playthrough before the deposit, bonus amount and any winnings can be withdrawn.